Are you ready for six original adventures featuring young players, loyal fans and club mascots – who face a desperate race against time to save the Super League Grand Final? Or how about the dilemma of a coach who is faced with a team who have never played a game of rugby in their lives – can he turn them into superstars? Or the fan who experiences rugby league the way it used to be played in the olden days? Or the group of pals whose love of the entertainment almost lands them in trouble? From magic boots to a special Christmas, there’s something here for everyone. Dewsbury-born Tracy Maguire is a passionate rugby league fan and writer whose short stories for younger readers have graced Super League club programmes and websites. 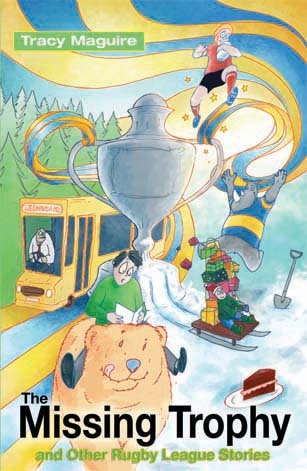 Here, for the first time, is a unique collection of brand new stories aimed at rugby-loving children.